Good connections from ship to port. Efficient check in procedures. Breakfast was a little underwhelming and the boat was full. Good instruction for first time snorkellers and the equipment was new and clean. I guess they can't control the fish who were maybe on holidays themselves, but we were fortunate and excited to swim with three large green sea turtles, a definite highlight until the manta ray wandered past ! This happened because of the skill of the lady guide who floated around the group spotting for us. All staff were great. Fantastic excursion with a great crew on 'The Pride of Maui'. Saw a whale while cruising to snorkel site, the snorkeling was amazing and catered for all abilities. 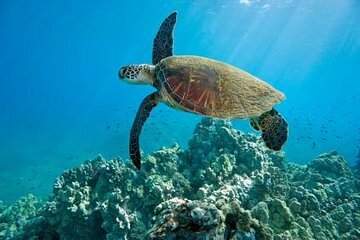 Coming from NZ we found the sea warm, snorkeling among tropical fish was surreal, seeing a couple of turtles topped off a great experience. Highly recommend this excursion. A fabulous experience. The excursion was prepared with any type of equipment for snorkeling, snubbing, or scuba-ing. Totally professional. Checked everyone out prior to going into the water. Had people in the water watching the snorkelers and providing tips. They also provided breakfast and lunch. You cannot find a better snorkeling adventure into the Molokini crater! This trip was easily one of the highlights of our honeymoon! for such a reasonable price we got a continental breakfast, lunch, open bar, and pristine snorkel locations! We were on the Norwegian cruise. Pick up was simple they met us just off the boat and had us driven by taxi all included about a half hour to the harbor. We were boarded on the boat the pride of Maui where they served a continental breakfast while we were taken to the first snorkel sport: Molokini. This spot was very clear and calm, probably the best snorkeling we had on this whole vacation! After spending an hour, we boarded the boat and made our way to the second location: Turtle bay. During the transport, we were served a lunch of hamburgers, cheeseburgers, chicken, and vege burgers for those interested. They also had soda and macaroni salad, as well as all of the fixings for your sandwiches. The second location was a bit choppy so we left a little early, but we did see a giant sea turtle! On the hour long trip back to harbor, they had an open bar with Maui brewing company beer and a variety of cocktails. The staff was super friendly and they had many options for those who wanted to do more than snorkeling. They had a photographer with underwater cameras and GoPro's for rent, an option to do SNUBA hybrid between SCUBA and snorkeling for an extra charge, and for those who where SCUBA certified they had SCUBA equipment - although this may be a separate excursion and definitely an extra charge. Overall, we would definitely go on this excursion again and would recommend this to anyone visiting Maui! Es lief alles sehr entsoannt. Wir wurden pünktlich vom Schiff abgeholt und rechtzeitig wieder hingebracht. Die Schiffsbesatzung hat sich sehr viel Mühe gegeben. Unterwegs wurde noch zu einemspannenden Whale Watching angehalten. Die Schnorchelgänge waren nicht so so spektakulär wie in der Karibik. Schildkröten haben wir zwar gesehen, aber einige Meter unter uns am Grund. Had a great time. Our first stop to Molokini crater was VERY crowded. There were about 8 boats at the reef and not much room to explore. We had to stay in a fairly small space. I actually got to see an octopus and a squid though, so that was way cool! Our second spot was not that special. I didn't see any turtles myself, although there were a few spotted. Lunch was really good. Hamburgers, hot dogs, with all the trimmings. Salad and veggies with fruit. The crew were all very attentive and helpful and friendly. I would give them a 5 plus, as well as the lunch. The reason I only gave it a 4 was because of how crowded it was. Definitely worth doing! The trip to crater and then to turtle beach were both great snorkeling. Took lots of videos and pictures. Crew on ship were fun and helpful. Snorkelling was as expected. Saw lots of turtles, lunch was wonderful. Crew was very helpful and informative. The entire day was great. We saw many whales, had great snorkeling and very nice lunch. The captain and staff were very informative and helpful.